I have a conditional that is If Age is greater than 15 AND if a rules and conditions widget is filled, then put First name and Last name into text box id347. 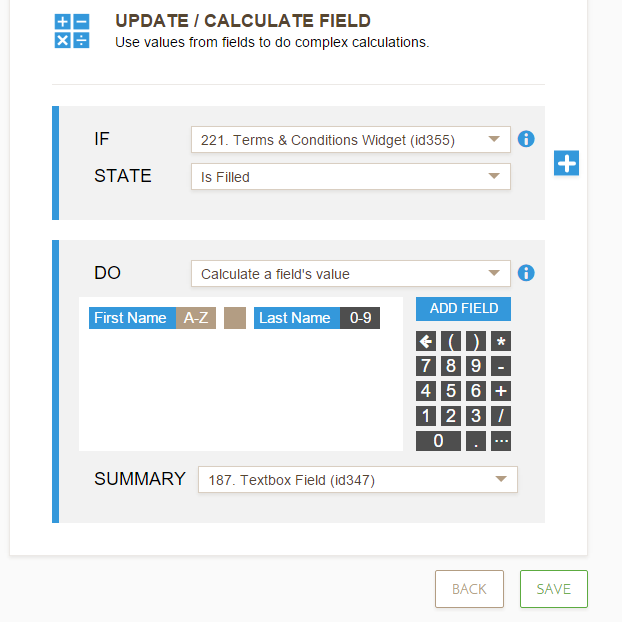 If I use the back button on that form and then the next button to go back, the field calculates correctly. I see you have 2 conditional logic associated with the textbox id347. If you check the first condition in my sceenshot, it says that if the "Terms & Conditions Widget" is FILLED then insert the first name and last name on the text box field. When you open that condition, you'll see that last name is set to "0-9" which gives you the value of "0". Now, the 2nd condition is being ignored. Why? Because condition #1 is already met. Here's my cloned form: https://form.jotform.com/60414106115945. You can see how it works. You might also need to disable the other condition or be much more strict on the rules to avoid conflicts. Do you wish to only allow users that are aged 15 and up to fill out the last text box? If you do, then you need to disable the first condition. Oh dear, I make the silliest errors.